I grew up in a home where we (read our gardener) grew our own vegetables and had an abundance of fruit trees. In our back yard was a grape vine and many a happy afternoon was spent with grapes being gorged. I would pop the succulent black grape into my mouth and break the skin with my teeth. The grapes were seedless, and sweet and I long for them. We don’t have catawba (lambrusca) grapes here, but I have found the most beautiful sable grapes and I am devouring them by the punnet. The season is short and the grapes are limited in production. The are black and seedless and remind me of my childhood. As grapes are in season right now, they had to form the part of this month’s regional and seasonal challenge. I decided that I could not do the obvious and make a smoothie, and neither could I make jam. I might still give the jam a go, but not with my beautiful grapes. So, I decided on a sauce to accompany our pork chops. I am sure this will go perfectly with duck breasts as well. 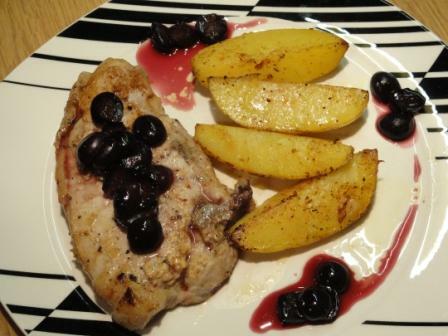 I love the sounds of your pork chops with grape sauce and can’t wait to hear how it turns out with the duck breasts. Stunning!!! I love the idea of grapes and pork! I’ve had a craving for pork chops for a while now, this looks very good. I’m doing your challenge today.